If you’ve ever seen a WebEx or GoToMeeting invitation in your inbox, you’ve likely had that chill down your spine as you once again face having to deal with a clunky UI so that you can sit and watch someone’s slide deck. Why can’t presentations be easy? Both easy to do and easy to watch. Why can’t they be spontaneous? Why can’t you choose to do a presentation and have people invite others via Twitter or Facebook? With Zipcast, the latest gift from SlideShare, now you can. The idea is simple. I sat down in a presentation with Rashmi Sinha, the CEO of SlideShare, and what she had to show me could easily disrupt the very way that you do online presentations. Zipcast is an interface where you can host online presentations, featuring your SlideShare deck. You simply give out your personalized URL and people then log in via Facebook or a quick login form to view and tell others about your work. There are no downloads, no waits and presentations can be easily shared on the fly. What you see above is exactly what you’ll see inside of Zipcast. Anyone with a basic SlideShare account can create a Zipcast URL and invite users. 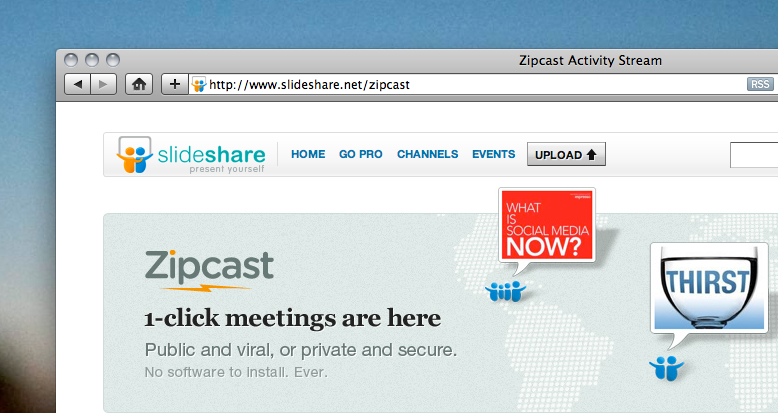 Even if you have a free SlideShare account, you can still hosts Zipcasts. Premium SlideShare members (of any level) get some added features such as streaming video and audio, as well as private meetings. What’s more? Since the entire Zipcast section is done in HTML5, it will run in any modern browser. Beyond that, the SlideShare team has created a Zipcast Activity Stream, so you can see the most talked about presentations, in a live format, at any time. When you consider that there are 45 million users uploading 3 billion slides every month, that’s an incredible amount of activity. After going for a freemium model a few months ago, it’s great to see the company continuing to expand its reach. We’re looking forward to a lot less WebEx and a lot more Zipcast in the months to come. Combine Zipcast with SlideRocket and you’ll have one incredible powerhouse of a presentation platform.